Goat farming is a fun and lucrative small business idea. It entails the raising and rearing of goats for fun, milk, meat, cheese, leather or medicine. It is one of the oldest farming practices and the easiest when you leave your goats to roam free. It is a highly profitable business venture and one that has seen a new inflow of investors. Goat farming in Africa is a wide scale business simply because it requires very little startup capital, and one can kick off the business by purchasing just two goats – a male and female. Commercial goat farming is even more lucrative, contributing greatly to the economy and providing job opportunities to thousands globally. The sweet taste of goat meat compared to cow meat is why there is a high demand for the product. Not only does the meat taste great, it is also lower in fat content than chicken and it has a much higher protein than beef. There is also an emerging market for goat milk and this has also led to an increase in the number of commercial goat farms worldwide. Goat’s milk is used for producing full cream goat powder, skimmed goat milk powder, goat butter, goat milk cream, fresh goat milk etc. Simply put, there is a market for this business but you already know that. Don’t you? As it is obtained in poultry farming, fish farming, snail farming, pig farming and a host of other agricultural businesses, the income potential in Goat farming is huge. When executed at the right scale, goat farming doesn’t just also generate a substantial income for investors but is also a large business opportunity. So, if you are a lover of goats and you want to enter into the goat farming business then are in for a treat. We are going to explore the world of goat farming and how to start a profitable goat farming business as soon as possible. Goat farming is one of those agricultural business ideas that can make you a millionaire. Nonetheless, Goat farming isn’t without its own challenges and we will go into details in a jiffy. ⇒ A baby goat is called a kid, and because of that, a goat giving birth is said to be “kidding”? We’re not … kidding. ⇒ Baby goats are kids. Male goats are bucks, female goats are does. Neutered males are wethers. ⇒ The average lifespan of does is about 10-12 years and 8-10 years for bucks. ⇒ In goats, the at period occurs every 18 to 24 days, or 21 days on average. Heat is the period in which the doe will stand and allow the buck to breed her. ⇒ Goats have a gestation period (pregnancy) of five months and the average birth rate for goats is 2 kids per year. ⇒ Goats communicate with each other by bleating. Each goat has a unique call, and scent. ⇒ Like Dogs, Goats can be taught their name and to come or respond when called. ⇒ Goats don’t have teeth on their upper jaw. Instead, they just have a strong dental pad. ⇒ Goats have rectangular pupils unlike the round pupils found in man. Thanks to this, they can see almost everything except for what’s directly behind them. ⇒ Goats have four stomachs. The four-chambered stomach helps goats digest tough roughage like grass and hay. ⇒ Goat’s milk is the most popular kind of milk worldwide. It is easier to digest than cow’s milk, even by people who are lactose intolerant. It’s also higher in calcium and vitamin A. ⇒ Goats, being mountain animals, are very good at climbing; they’ve been known to climb to the tops of trees! ⇒ Goats, in general, are very social, curious, gentle, independent and intelligent creatures. They get bored and lonely when alone. It is never a good idea to just have one goat, you need at a minimum two goats. ⇒ Goats hate to get wet and will stay out of puddles and try to avoid the rain at all costs. You need to provide them with ample dry shelter before you bring goats onto your farm. ⇒ Dairy goats need to be milked at least once a day, seven days a week, rain or shine, cold or hot, until they dry off. You cannot go on vacation and leave them un-milked. They will be in pain and they will develop mastitis. ⇒ Goats can get sick very easily and they die very fast. What are the Byproducts of goat farming? You probably know that goat meat is in high demand. And most commercial goat farmers rear goats to for this purpose. ⇒ Meat: It’s been said that over 60% of meat consumed annually is obtained from goats. You probably know that already. ⇒ Milk: Goat milk is rich in many essential nutritional elements. Above all, it is easily digestible compared to cow milk. It is also low in cholesterol and non-allergic compared to cow milk. Other dairy products derived from goat aside milk are yogurt, cheese, and butter. Consequently, there is a huge demand for goat milk in the local and international markets. ⇒ Goat Skin: All goat breeds have skin. But some of them produce high-quality hides which can serve or be used in the production of leather items. ⇒ Manure: Goat feces is a good source of organic manure. Some crop farmers prefer organic manure over the inorganic types. This provides another business opportunity. WHat goat breeds ARE SUITABLE FOR FARMING? There are so many species or breeds of goat. In fact, some have affirmed that we have over 320 breeds of goat distributed across the globe. What this implies for potential farmers is that you need to research what kind of goats are available in your locality and the qualities these goats possess. Certain goat breeds are best for meat production, some are put to use as dairy goats, others possess good skins for high-quality leather while some are raised for their fiber/mohair production. These goat breeds are different in stature, shape, and features. Also, Recent advances in technology and understanding of crossbreeding have also led to the rise of the almost perfect goat. But there is nothing like a perfect goat. It is your duty to decide the best breed for your business, one that is readily available in your region and meets your business need. Having decided on the goat breeds to go for, find and purchase healthy kids. One with a history of Deworming and Vaccination. We are not saying that other breeds don’t produce milk. But these one serves that purpose perfectly. They are famous for milk production. There are other popular dairy goats available. It all depends on your location. Take time out to find out what’s popular in your region. As the name suggests, they are notorious for their muscles and will make meat available when called upon. Some goat breeds in this class are also highly productive. Such that they produce numerous kids per parous experience. An example is the Black Bengal. Most of them are equally good milk/meat producers. Few examples in this class include Zhongwei, Don, Garganica, Jining Grey, Maradi, Black Bengal, etc. You need more than books to learn about goat farming. What you really need is a firsthand experience. Pay a visit to a goat farm close by or register to take a practical course in goat farming. Don’t mind the cost, it will be worthwhile once the cash starts flowing in. Interact with members of your local goat farmers’ association. Their practical experience is invaluable, and can hardly be adequately represented in any textbook. This does not rule out the place of literature. In fact, borrow or purchase as many books on goats and goat farming as possible. Devour as many materials as you can find on the web. The goal is to make you an authority in goat farming and probably make you a teacher for all those who will follow in your footsteps. Don’t undermine the power of a good business plan for your goat farming business. Having a business plan is essential to the success of every business. It is unwise to go ahead without setting up a clearly defined plan for your new business. You see, there are so many myths on the subject of how to write a good business plan. Some people present a business plan as if it was a university thesis to be defended before certain professors. Other people think that a business plan has to be 100 pages long and that it must be written in a certain “approved” format. All these are totally untrue. Your business plan is first about you and how you perceive your business. Then, it can be used to communicate your visions with other. And when the need arises, you can use it to source for funds. A business plan articulates the goal of the business, details the expected path of progress over a period of time from its inception, and makes for a clear sense of direction. With it, you will have something to refer to when measuring the performance level of the business against your objectives at the time of inception. The goat farming business plan may include certain areas like the cost of human and material project inputs (labor, land, goats, feed, sheds, and other facilities), marketing strategy, competitor analysis, and financial forecast. As earlier mentioned, this is one of the most important parts of this business. It is why you created a business plan in the first place. You can scroll up to have another glimpse at the classes of goat available for your business. 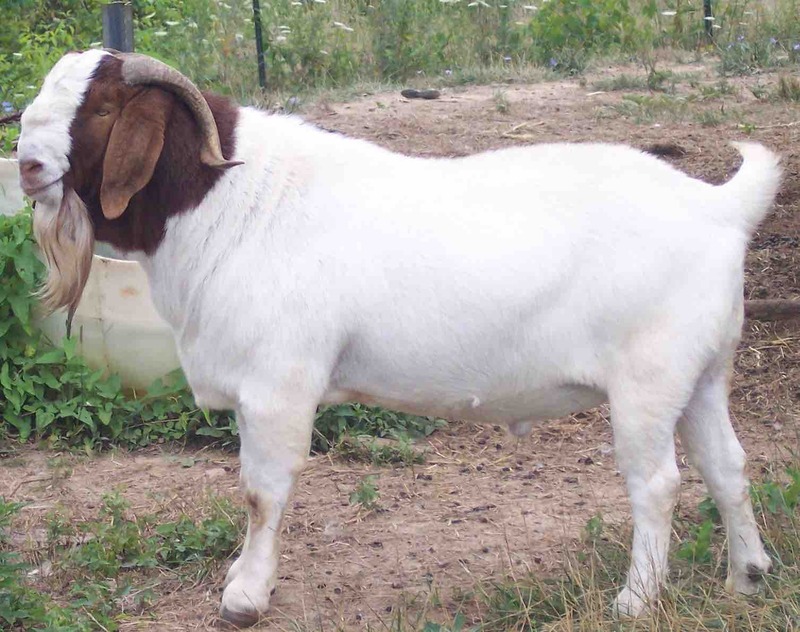 But for the sake of emphasis, let’s take a brief look at some popular goat breeds in Nigeria. They are called dwarfs due to their small size. They are good milk producers but many farmers use them as food. The Nigerian Dwarf Goat can produce 3-4 pounds of milk per day. They come in many colors including black, red, cream, white and different mixed color. Most have horns although a lot of farmers disbud them at their young age for safety to the goat, its herd mates, and human caregivers. 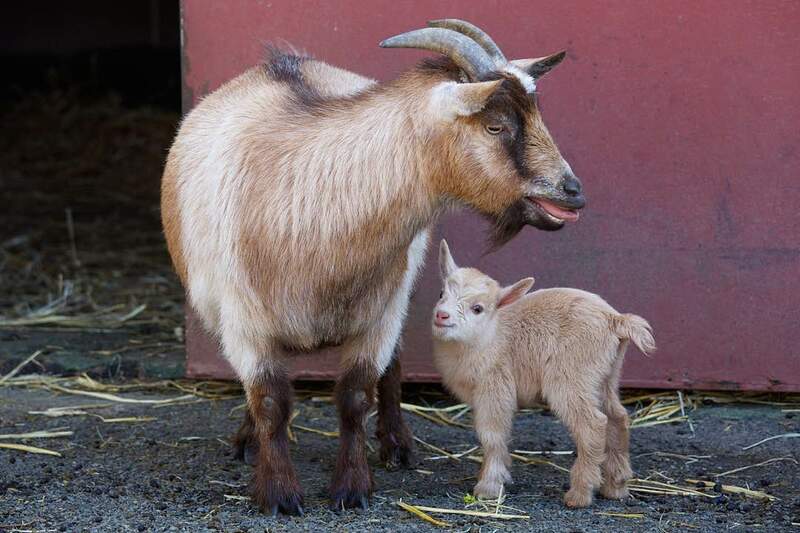 The Nigerian dwarf goats can breed year-round. On an average, a doe can give birth to 2 to 4 babies at a time. 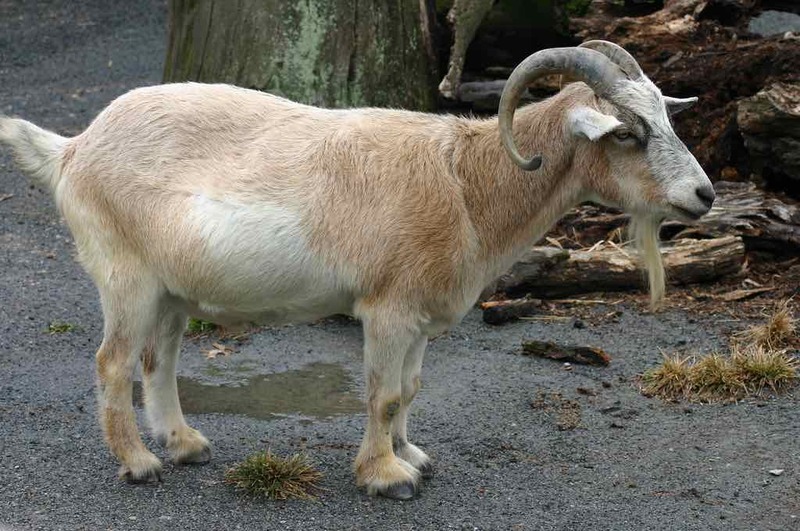 It is a unique breed of goat with a long hanging ear, Roman nose, and are majorly reared in South Africa before their introduction into Nigeria. The Boer goat is a great meat producer and you won’t run at a loss if you plan to sell this goat for that purpose. Unlike the Nigerian dwarf goats, they are big and ready for battle. They also grow very fast and for this reason, they are very popular among commercial goat farmers. If you want a meat producer, the Boer goat is a great one. These goats are big, graceful, and also known as Anglo-Nubian. They are the cross-breed of British and Indian goats. They are appropriate for all types of purposes including meat, milk and fur production. Colour ranges from white, black, brown to mixed and they also have long sized pendulous ears hanging close to the head. An Adult female weighs about 135 pounds or more and can produce about 2-3 liter milk daily. You need a suitable piece of land for your goats and other livestock. The land doesn’t have to be extraordinarily big. Nonetheless, goats are foragers and they like to wander a lot. So you still need a healthy quantity to keep them happy. The size of the land is mainly dependent on the number of goats you plan to keep. The more your goats, the more piece of land. Moreover, adequate spacing will help detect sick animals and also reduce disease transmission. Some have argued that a maximum of 10 goats should be kept in an acre of grazing land. Such that if you intend to keep up to 500 goats, you will need 50 acres of pasturage. The truth is that there is no hard and fast route. But adequate spacing is very important. And remember that goats can multiply rather quickly since twinning is very common in that species. The piece of land should also be relatively clean and free of anything that can injure your animals. Proximity to a market where products from the farm can be sold and required inputs bought is also important. Clean water should be readily available and a fence should be constructed around the grazing area to keep them from wandering too far. The fence can also ward off dangerous animals like wolves, foxes, and coyotes (one of the most common predators in the United States). The fence should usually be a short perimeter fence coated with barbwires. You can also create “play areas” for the goats to hang around and have fun. Goats like climbing structures and more, creating such structures will keep them preoccupied. Having a grazing land isn’t enough. Your goats also need shelter from extreme weather conditions and a place to lay when the need arises. As previously mentioned, Goats like to stay indoor when it is raining or extremely hot and will only come out to graze when the conditions are favorable. It’s important that the barns built are segmented for various groups of goats. It will be better if you can keep the nursing and pregnant goats separately. Use a higher ground for making the goat house. This will keep your goats from creeping creatures and flood. The barn must be dry at all times. A dampened condition is a good growth media for disease-causing organisms. Always ensure there is a huge flow of light and air into the house. The house should be strong, comfortable and spacious. Keep enough space inside the house for taking rest. A house of 1.8 meters by 1.8 meters by 2.5 meters (5.5 ft * 5.5 ft * 8.5 ft) is suitable enough for housing 10 small goats. An Adult goat needs about 1.5 square meters housing space. Any sick animal should be isolated, and in the case of death, make sure to bury or burn the animal far away from the shed. Goat manure should be removed from the shed on regular basis to avoid any diseases. Generally, these types of houses are built over the ground and it a is a very common goat housing system in India. The shed floor can be built with cement after which dry straw is laid on it to maintain warmth. These goat sheds are built on poles, usually they height of the floor is going to be about 1.5- 2 meters above the ground. 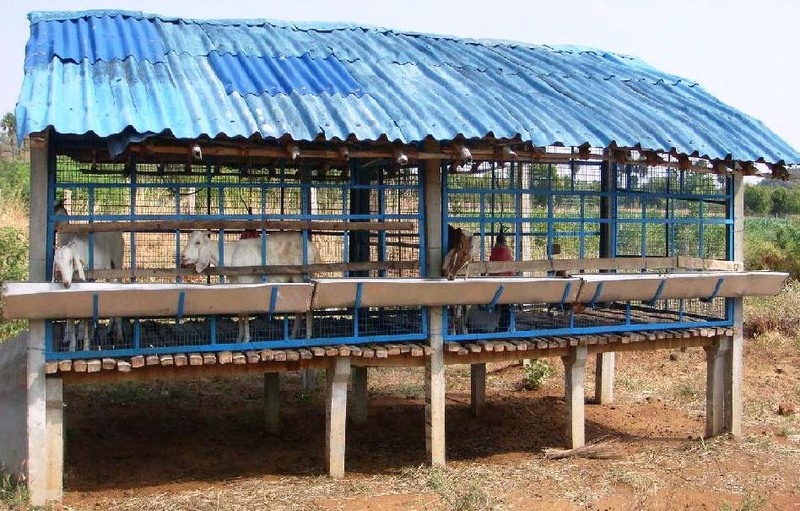 This goat housing system protects the animals from wet conditions and it is particularly useful flood prone or waterlogged areas. When goats eat well, they function well and also provide good returns. Goats can eat almost all types of crop, grains, and leaves and that’s why a good grazing land is advisable. Goats feed well when they are left to source for their meal in a controlled setting. Make pasture plants available including Bahia grass, Sudan grass, millet, a mixture of a grain grass, sorghum, grass, and clover. If you have enough capital, you can also invest in hydroponic green fodders. In the hydroponic fodder system, your goat will get food from natural sources cultivated in trays and artificially nourished. All in all, always feed your goats with quality food, whether using additives or through controlled grazing. For optimum growth and functioning, mix different ingredients in the goat feed. The presence of Maize, Wheat, oats, barley, water, Orange peels, banana peels, Garlic skins, tomato ends, etc. will ensure a balanced goat diet. Reach out to an Animal nutritionist for professional guidance. Goats like every other animal fall sick periodically. Sickness could range from a simple injury to a life-threatening disease. And that’s why it is important to raise your goats in a hygienic environment. You also require the services of a veterinarian doctor from time to time. Depending on capital and the size of your farm, you can have one on standby. Your veterinary doctor will help in the prevention of diseases through vaccination and will also help in the early detection and treatment of certain goat diseases. The veterinary doctor will also offer advice on first aid measures in times of emergency and will probably provide a list of medications that should be available on your farm at all times. Some veterinary doctors will also offer nutritional counseling and goat physiotherapy when the need arises. Do make sure that you keep the appointment with your doctor if you hope to keep mortality at the lowest. Worm infestation: You could notice Diarrhea, constipation or even find worms in their feces. Abortion: This could occur due to drinking water containing Salmonella typhinmurium. Anthrax (Bacillus anthracis): Sudden high temperatures, loss of appetite, sudden death, in less acute form the goat may live for a day and develop bloody diarrhea. Rinderpest: the symptoms are Ulcerative lesions will appear inside the lower lip and on the gums. There will also be a mild thermal reaction and diarrhea. Brucellosis (Brucella organisms): Abortion in late pregnancy. In male goat, infertility, orchitis, and swollen joints are seen. Dysentery: This show presence of bloody diarrhea. Enterotoxaemia: It Is caused by the toxin of Clostridium perfringens type D. One of the causes of sudden death in kids. Annual vaccination is required. Foot and Mouth Diseases Virus (O, A, C and Asia one type): Vesicles on the tongue, lips, cheeks, gums, dental pad and on the skin between claws, occasional blisters on teats and under. Other goat diseases include heat stress, mastitis, rabies, tetanus, Tuberculosis, Tapeworm, Goat pox, indigestion, etc. Indeed, the place of a veterinary doctor is undisputed. They isolate themselves from the herd and sit down for a long period of time acting in an abnormal manner. They lie down for many hours and appear lifeless. They suffer from a painful condition called bloat. It swells up their midsection and they often moan in a pitiful manner. Keep the environment clean and dry. Wet conditions favor the growth of diseases. Kids should stay in separate barns until their immune system is mature enough to handle adult disease. Never keep recently bought goats with your existing farm goats without a medical screening. Separate the healthy goats from the sick ones. This will curtail the spread of diseases. Dead bodies of the affected goats should be burnt with fire or buried deep in the soil. You don’t wait until your goats are mature before you start marketing. Early in your business, you need to start making plans on how to sell your goats or byproducts from your goat farm. Generating high revenues and eventual profits is never an easy feat for any business and that’s why your goat farming business plan will go a long way in solving this problem. This is a crucial step in marketing. 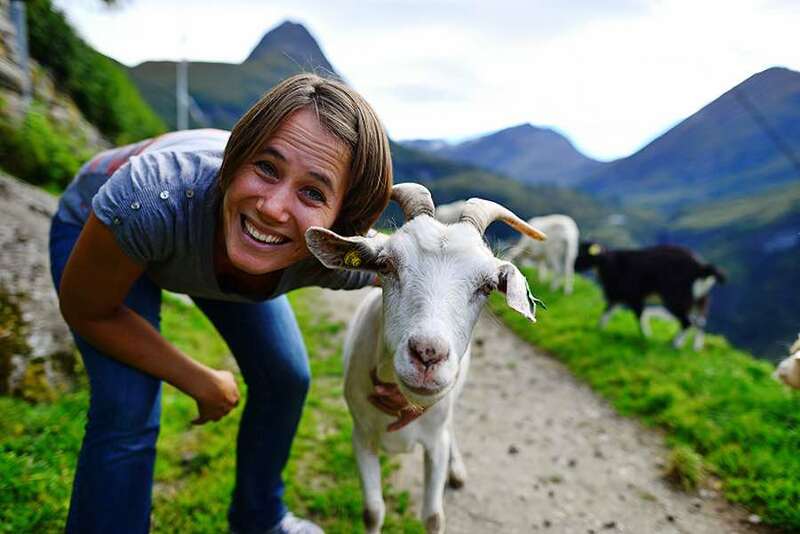 You should identify a target market before you setup your goat farm. Your market could be local (within your vicinity) or International(exporting). And knowing this from the start will guide you to put certain structures in place. Joining a goat farmers’ association is a cost-effective way to learn the tricks of the trade and how other farmers market their business. Setup a retail store in a major market or city. This way, you get to control every aspect of distribution and sales. You also ward off the middlemen who tend to undervalue your stocks only to sell at exorbitant prices to others. Commercial food markets are a great place to find retailers. Approach potential retailers, make them aware of your farm’s existence and offer them a better deal than their existing suppliers. Don’t forget to link up with Hotels & restaurants in your city. Convince them about the safety of your products. Then offer them a great deal. You can set up an online store or use some of the established online grocery stores in your country. Another great option is to promote your business using social media. Take pictures of your goats and share them on popular social media platforms. Don’t undermine the power in a tweet. You have probably gone through this post and you are wondering whether to go ahead with starting a goat farm. 1) Goats are in high demand in many parts of the world thus creating a rear export opportunity that is absent in other businesses. Australia is one of the largest exporters of live goats and goat products in the world, yet they are unable to meet the demand of importing countries. Goat meat is also consumed in large quantity in Nigeria and a large portioned Africa.And only a minority are into farming. The opportunities in this business are endless. Still having doubts? And only a minority are into farming. The opportunities in this business are endless. Still having doubts? 2) It’s much easier to raise goats than chickens. First goats love pasture and will fend for themselves once there is enough grazing land. Secondly, the byproducts from goat far outweigh what you get from chickens (probably eggs only). Thirdly, goats are cool. 3) Goat manure is a rich source of nutrients for your soil and can be used for flowering plants, herbs, vegetables and fruit trees. You can also compost it and use it as mulch. 4) Goats can coexist peacefully with other animals. They are good companions and hardly cause problems. They have been seen to share the same farm with cattle, horses, donkeys, sheep, chicken and even dogs. 5) You don’t need to buy milk again. Get all the milk you want from your Goats. You can also knit your own sweaters if you rear the fiber producing goats. Definitely worth talking about. You need to set aside a modest sum of money depending on how large your farm will be. The cost of getting kids, goats and even land differs from place to place. Others started on a commercial scale and are doing fine as well. All in all, start slowly and expand as you go. When the time is ripe, take over the world.